Newsflash – the avenues and methods of marketing may be changing, but what isn’t changing is the fundamentals behind it. At least, that’s what William Mougayar of StartupManagement.org is saying. He writes right now, things may be changing in terms of methods, priorities, tactics, channels, and tools. 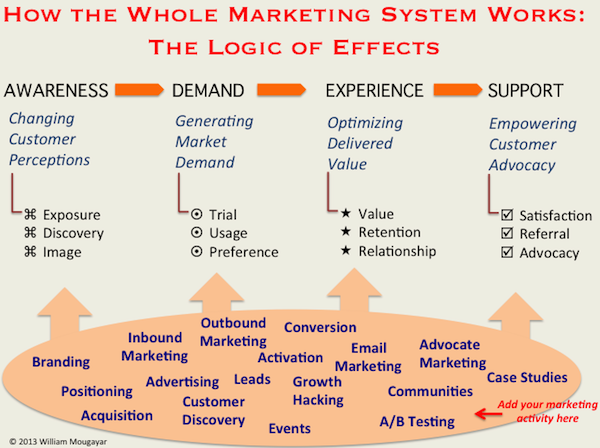 However, things like the concept of the “whole marketing system” are static. It hasn’t changed that if you hear of a new buzzword, tool, or tactic, it will start in one place in the marketing system and will fit in the Awareness -> Demand -> Experience -> Support cycle. And as customers become advocates for a product or service, they will make others aware of that product and service, providing free advertising. And while many of today’s marketers get really excited about digital marketing, it’s important to remember digital marketing doesn’t happen in a vacuum. Instead, it’s a product of marketing. The keys of digital marketing, same as regular ol’ marketing, are awareness, demand, experience, and loyalty. Awareness – You need to make others aware of your product through increasing its exposure, making it discoverable, and creating a positive image about it. This is where inbound marketing fits in. Demand – You need to create demand for your product by offering people the chance to try it out or evaluate it. From there, they should use it more often and eventually develop a preference for it. This is where growth hacking might fit in. Experience – With your existing customers and users, you need them to experience the value of the product every time they use it. That will strengthen not only your retention power over them, but also your relationship. Loyalty – This is the ultimate reward of a customer who is happy with your product and refers it to others, becoming your advocate. This boosts the market’s awareness of your product, because people tend to follow others’ recommendations. No matter what, all of marketing fits into one of these four categories, Mougayar writes, adding the key is to provide great marketing for a great product.